With a team of highly skilled trades people with years of knowledge and expertise M Powell Building Services has become one of the leading masonry construction companies in South East Wales. This expertise has extended into many types of earth retaining Solutions. Retaining wall construction and cladding is one of our specialities, not only do we design and construct these structures for our own private clientele, our tradesmen are acquired by many civil engineering and blue chip companies requiring specialist masonry contractors to build and clad retaining walls on their projects. 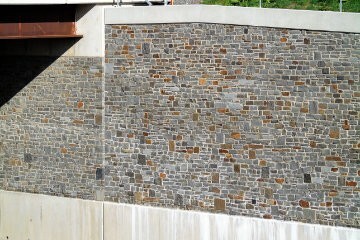 Mass masonry walls consist of a mass of masonry such as concrete blockwork and/or stone. These are commonly found at domestic and commercial properties. The mass weight of the wall holds back the earth behind it. 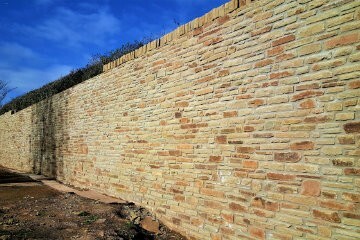 The wall can be faced with stonework, brickwork or in fact any finish for aesthetics. Reinforced masonry walls consist of two skins of blockwork with a reinforced concrete core. The skins of blockwork are tied together using wall ties and these walls eliminate the need for shuttering. 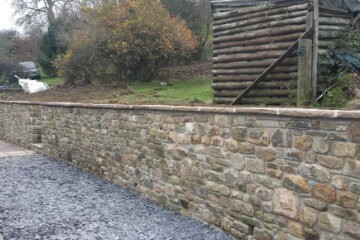 This type of wall can be faced / cladded with stonework, brickwork or in fact any finish for aesthetics. Gabion baskets are wire cages filled with stone which are often used within commercial projects as well as supporting embankments at the sides of public highways. Private property owners are using gabion baskets in their gardens and driveways more and more as it’s become a relatively cheap way to stabilise ground and open up space. A cantilever retaining wall is one that consists of a wall which is connected to a mass slab foundation. This slab foundation is loaded with clean stone back-fill and thus the weight of the back-fill stops the wall from overturning. 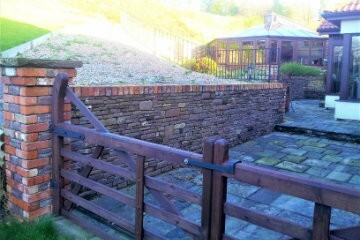 From design to completion, M Powell Building Services Ltd offers a comprehensive range of earth retaining solutions. Equipped with a team of high calibre tradesmen who construct walls day in day out we can offer our customers a unique, professional service. As with most development projects, space is paramount, retaining walls have become more common to help maximise space and return on investment. With our experience, knowledge in earth retaining solutions and straight forward approach we have become the first call for many developers throughout south Wales for well over a decade. Environments differ massively within the civil engineering sector, thus requiring a different approach regarding the skills and qualifications that most other companies struggle to obtain. With our high regard to health and safety and continued development M Powell Building Services have a specific team of qualified employees who are able to utilise their skills and expertise in the civils sector. Investing heavily over the years our team of masonry tradesmen have undergone extensive training to allow them to work safely and efficiently within areas such as highways, places of confined space and at height. This in turn has helped us gain Chas, Smas and constructionline recognition thus demonstrating our commitment to health and safety compliance.